The Turkcell MaxiPLUS5 is an Android 4.0 NFC smartphone, made for the Turkish operator by Chinese manufacturer ZTE. The handset features a 3.5-inch touchscreen, a 5MP camera and an 800MHz Qualcomm processor, as well as 2G/3G, Wi-Fi and Bluetooth 2.1. A magnetic NFC tag which is designed to go on the user’s fridge is also shipped in the box. The fridge magnet starts a Turkcell home shopping app when scanned with the handset, allowing the user to order goods from the operator’s merchant partners. 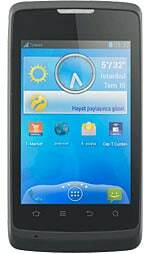 The MaxiPlus5 was announced on 14 July 2012 and is available immediately. The device can also host Turkcell’s Cep-T Cüzdan NFC-based mobile wallet.